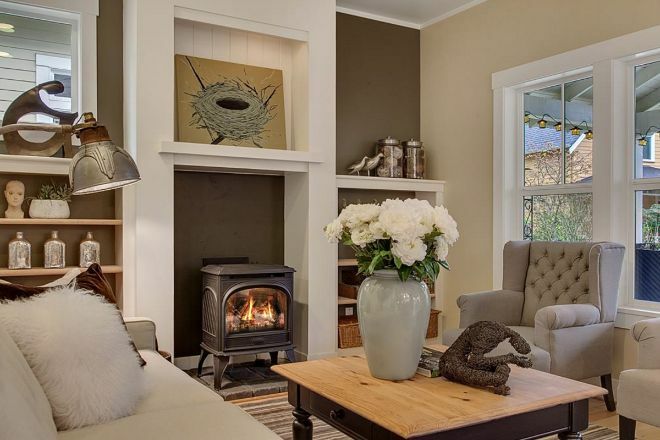 The Cottage Company is no stranger to building beautiful modern cottages. 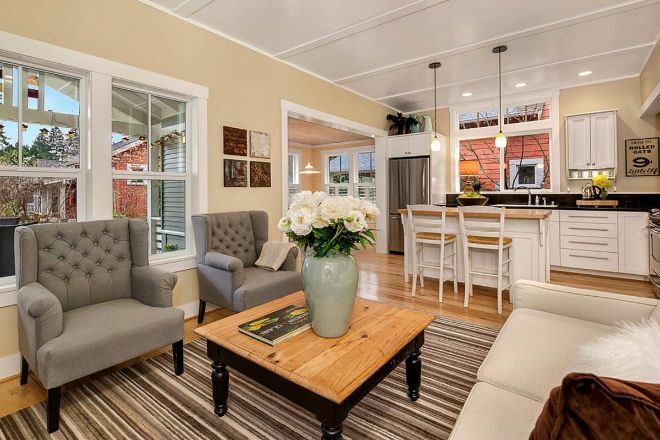 The Washington-based business specializes in conceiving "pocket communities," like the Greenwood Avenue Cottages in Shoreline, Washington. 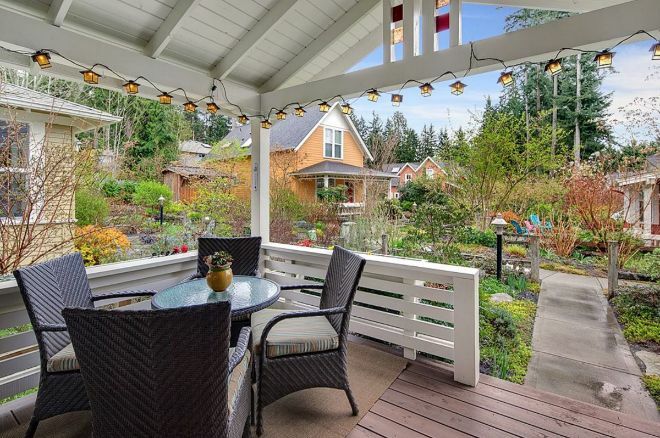 These communities are essentially microscopic villages with cottages overlooking shared gardens, most of them mere miles away from Seattle. 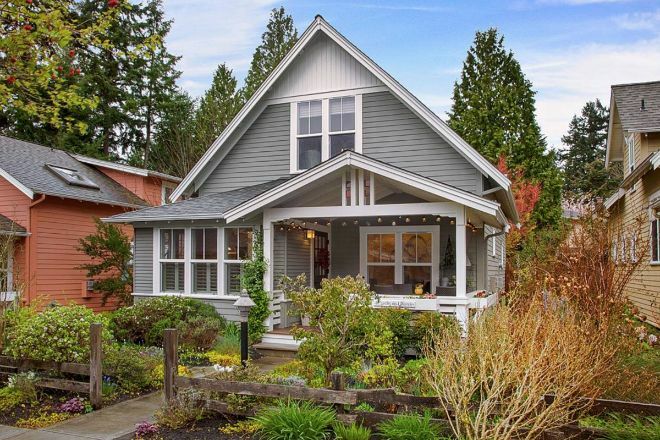 Danielson Grove, in Kirkland, Washington, is another exemplary creation of theirs. Sold less than a month ago, one of the lovely houses in Danielson Grove is still being displayed online for us to have a look-see. The pictures below will give you an idea of what the real thing would be like. The plants growing around the house create a useful offset to the gray facade of this house, which was named "Le jardin de Lavande" – "The Lavender garden" in French. The living room is refined and elegant, blending brown and white hues together. The walls contain shelves built into the structure, able to contain various decorative elements. The same living room is connected to the kitchen area, creating a large open space punctuated by wide windows for plenty of light. Off to the side, a dining room is connected to the kitchen and living room. The low hanging lights in these areas help to provide a well-lit atmosphere at all times. 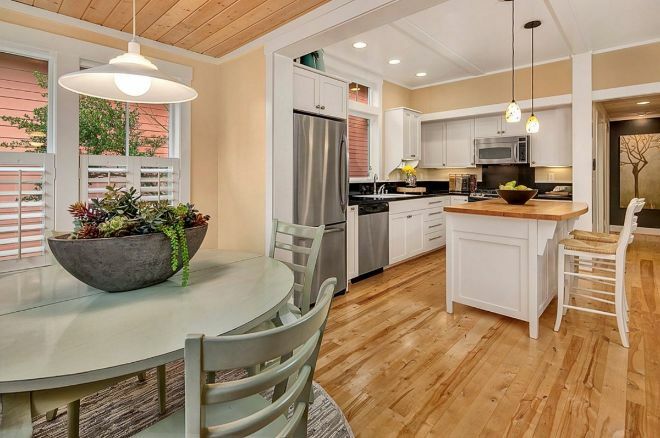 The kitchen features an island for easy meals or for when you're cooking with company. 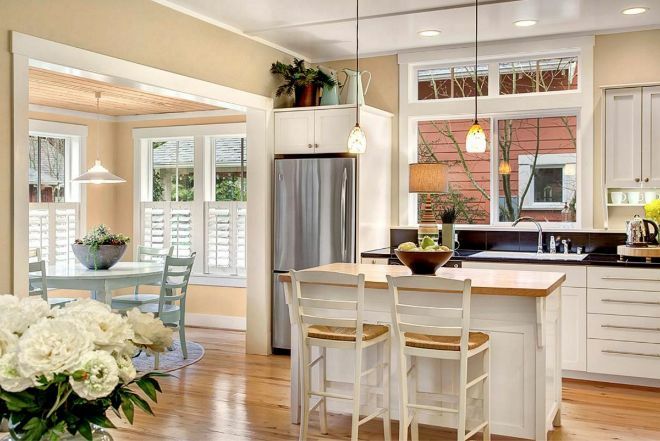 The high windows above the counter add to the low-hanging lamps so you'll never cook in the dark. Many of the common areas in this house contain a form of wood paneling on the ceiling, like the one pictured here. This unusual feature adds a textured depth to an otherwise fairly standard room. 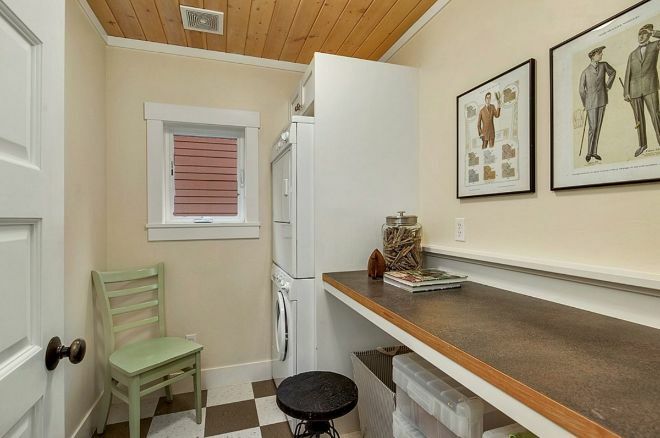 The pattern is repeated in the laundry room, giving it a warmer, cozier look, while the counter running along the wall provides an almost bar-like quality. 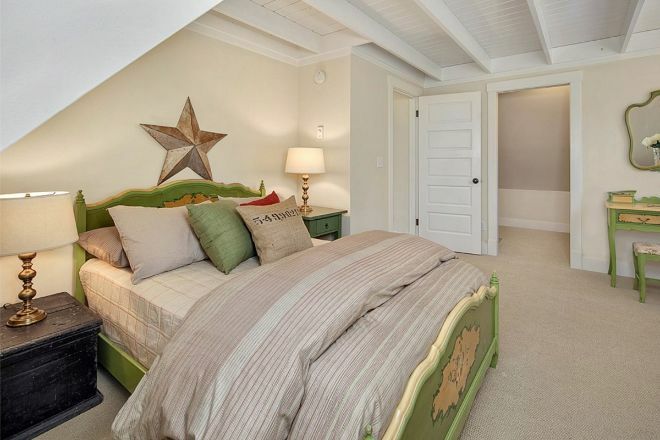 Both bedrooms each have their own walk-in closet for extra comfort. The ceiling paneling here is a little different from the one downstairs, but still provides a great architectural bonus. A set of shelves and drawers along the stairway to the upper floor makes for easy, unencumbered storage. 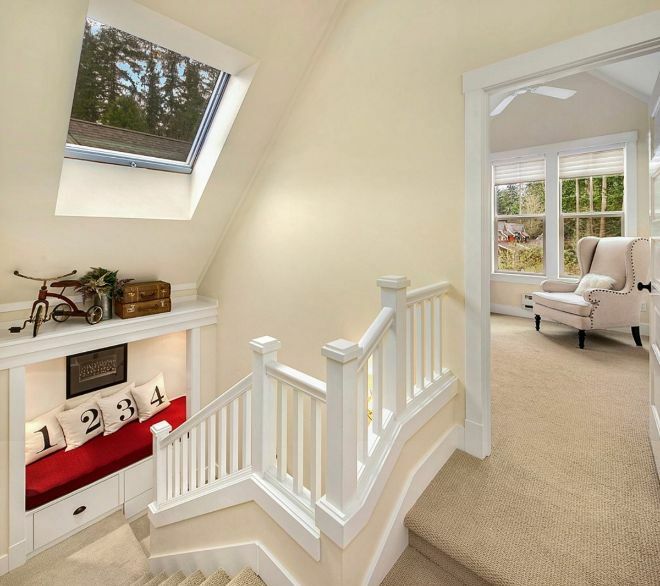 A skylight will also provide a much less claustrophobic area. 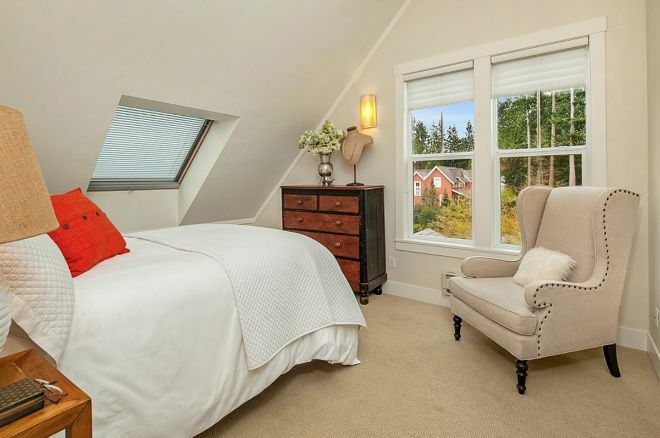 The second bedroom provides two windows and a skylight near the bed for a great view of the community. 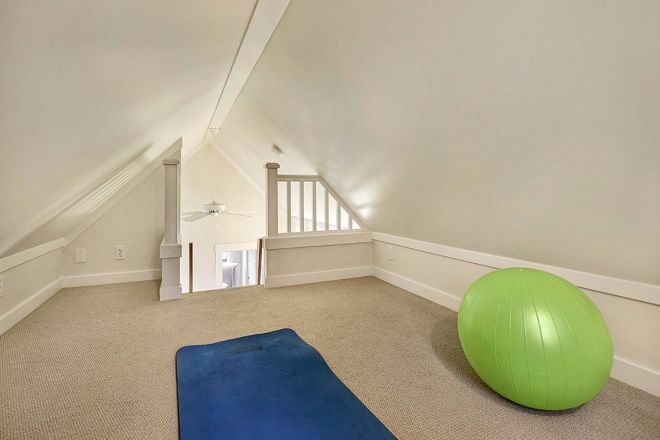 The attic is polished, clean, and equipped with carpeting, but is completely empty, allowing you to use it as an exercise room, for example, as opposed to a dusty old storage space. 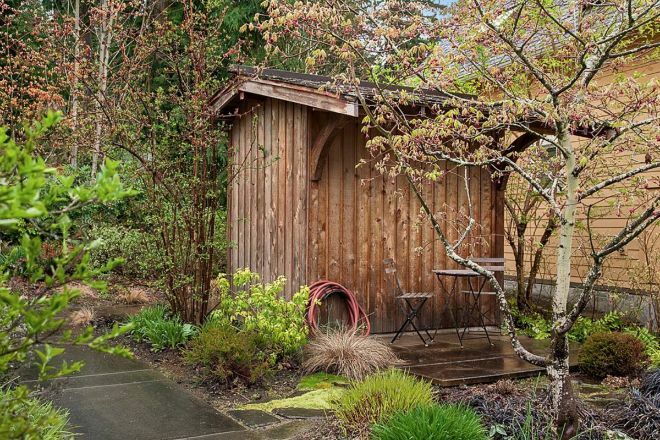 A little tool shed in the backyard lies next to a charming outdoor seating area for those warm summer days. 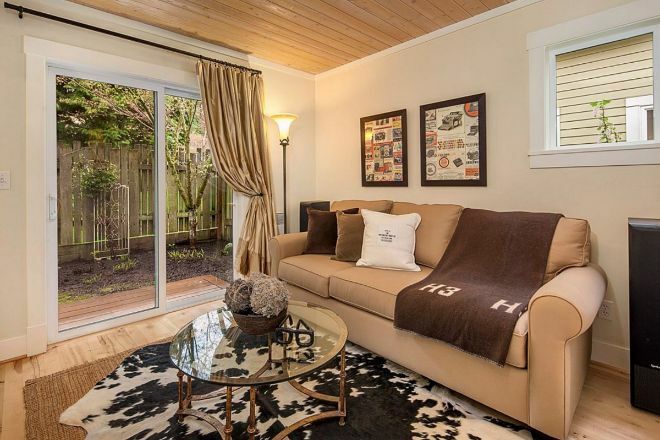 For a more convivial experience, however, the front porch itself features a table and comfortable chairs for tea or brunch with the neighbors, complete with a beautiful view of the community gardens. 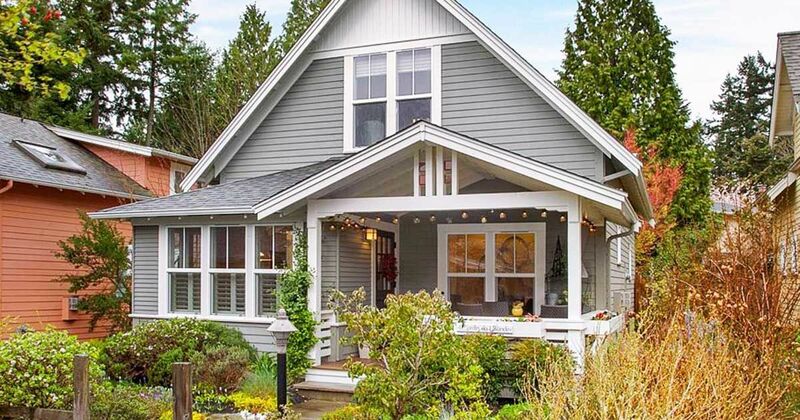 What do you think of this home? Let us know in the comments and share this home tour with your friends!